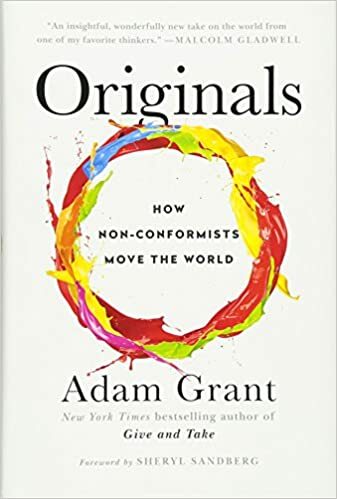 Non-conformists are the best - it starts with establishing why non-conformists are taking on a lot of risk by being one, why it is difficult to actually even recognize original ideas, and then why it is difficult to convey the original ideas and get them approved. Non-conformists don't conform to the general stereotype - unlike the general stereotype of first movers who rush in with their ideas, and leave everything for it, non-conformists often hold onto their day jobs while working on that super idea and they actually procrastinate till the right time. How to 'groom' non-conformists - finally, the book gets to how you can allow non-conformists the space to blossom in your organisation and in your home (as a parent). And, also what non-conformists could themselves do for creating more impact. In one sentence - Brilliantly written. But not very original, nor very convincing. Brilliantly written - Adam is a great story teller and also a psychologist who knows how to make the reader engaged using numerous 'hooks' so you'll love to read the book. This is why you see all the great ratings for his work. Not very original or convincing - The book is very poorly stitched together - and in fact, it appears to be forcefully stitched together. He wrote his hypothesis and then it seems he interpreted every research with that lens - a case of intentional confirmation bias? BTW, this is him - his first book, equally famous, was similar. I read his books for the perspective and because they give me a window into a number of fascinating anecdotes and research projects. Like us on Facebook https://www.facebook.com/HappinessCenterByMSA/ for more amazing stuff.